Waqar Naseem Wamiq "Riyadh Daily"
Pakistani blockbuster movie "Parwaaz Hai Junnon" aka PHJ produced by HUM films becomes the first ever Pakistani movie officially released in Saudi Cinemas following the decision in last December 2017 by the Saudi Government to reopen cinemas in the Kingdom. The glitzy premiere of PHJ was duly organised by the Riyadh based Knowledge Core Academy and the Top events org at the auspicious of VOX cinema in Riyadh that was highly graced by the hearthrob film hero Hamza Ali Abbasi, Heroine Hania Amir, Saudi Deputy Minister of information Nasser Al-Hejailan, Saudi Advisor of Ministry of Information Faheem Al Hamid, Chief Executive Media Badar Al Zahrani, Pakistani Envoy to Saudi Arabia Khan Hasham Bin Saddique, Saudi Ambassador to Pakistan Nawaf Al Maliki, Pakistani Defence Attachè Brig. Haroon, Pakistani Air & Naval Attachè Arshad Mukhtar, Pakistani Parlimantery secretaries Kanwal Shahzaib, Javaria Zafar Aheer, Pakistani Information Minister Fawad Chauhdary's wife Heba Fawad, Media person Fariha Idrees and the CEO of HUM films and the producer of PHJ Duraid Qureshi, KC director Amir Shahzad, CWA Abdul Shakoor Shaikh and several prominent Pakistanis. Parwaaz Hai Junoon (Soaring is Passion) is a 2018 Pakistani Arirl combat romantic film revolving around the lives of Pakistani Air Force Cadets & Pilots. It is directed by Haseeb Hassan produced by Momina Duraid, written by Farhat Ishtiaq and distributed by Hum Films. The film features a talented and powerful cast consists of Hamza Ali Abbasi, Ahad Raza Mir, Hania Amir, Kubra Khan, Alamdar Khan, Marina Khan, Shamoon Abbasi, Adnan Jaffar, Shaz Khan, Shafaat Ali and Mustafa Changazi in various roles. Speaking on the occasion Saudi Advisor of Ministry of Information Faheem Hamid Al Hamid has said, "Today are very historic moments of Pak Saudi cultural relations, we will continue our support to promote Pakistani films in Saudi Arabia", he said. Saudi Envoy to Pakistan Nawaf Al Maliki remarked the brotherly relations of both of the countries, "Saudi Arabia & Pakistan are one of the important countries of the world and are well known for their cultural diversities. We will strengthen our peoples to peoples contact by promoting our cultures", he mentioned. Pakistani Ambassador to Saudi Arabia Khan Hasham bin Saddique praised the Crown Prince Muhammad Bin Salman's vision 2030, "Pak-Saudi social relation should develop further and this is a great step moving forward with the Saudi Vision 2030 by the Crown Prince Muhammad Bin Salman", He said. The film producer of "Parwaaz Hai Junoon" Duraid Qureshi briefed the audience about the movie, "PHJ is the first ever commercial movie produced about the Pakistan Air Force. We tried our best to convey through our movie about the professionalism and the bravery of Pakistan Air force protecting our homeland", he said. Duraid praised the efforts of Knowledge Core, Top Events, Pakistani and Saudi Ministries and Embassies in promotion of Pakistani films especially the PHJ. He highly praised the vision of the Custodian of the two holy mosques King Salman bin Abdulaziz and the Crown Prince Muhammad bin Salman for allowing the Pakistani movies to screened in Saudi Arabia. Duraid also paid his thanks to the audience and the Pakistani community in Saudi Arabia for their fruitful response to "Parwaaz Hai Junoon". 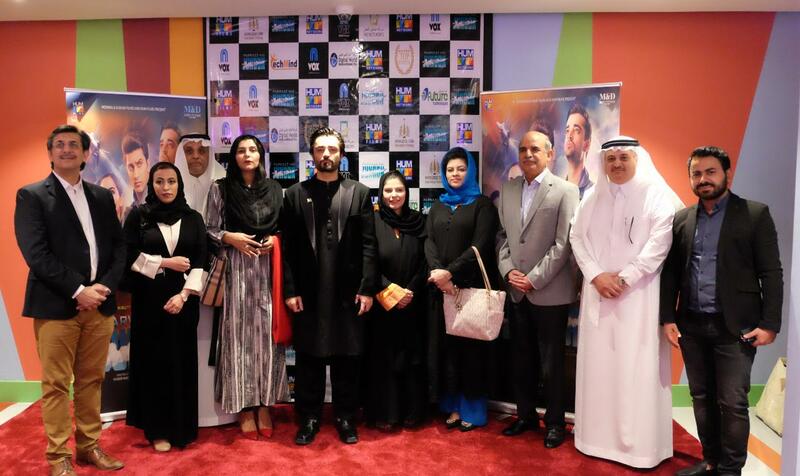 PHJ's Hero Hamza Ali Abbasi appeared to be happy and was so glad upon the launching of his film in Saudi Arabia, "Saudi Arabia is very close to my heart and I feel so happy to be here on the premiere of my film and I wish to see more Pakistani movies on the Saudi Cinema's screens", Hamza said. PHJ's Heroine Hania Amir was overwhelmed by the great Saudi hospitality, "I am truly happy to be here in Saudi Arabia on the premiere of our movie "Parwaaz Hai Junoon", the red carpet reception at the VOX cinema is beyond my expectation and the response by the audience was so great", she said. Director Knowledge Core Amir Shahzad reaffirmed his committment to promote Pakistani culture in Saudi Arabia. Pakistani Parlimanterians Javaria Zafar Aheer and Komal Shahzaib described it as a new era in Pak-Saudi relations that can bring more and positive opportunities for both of the countries. After the successful screening of the movie, various Pakistani community representatives highly praised the standard and the quality of the movie. They rejoiced with the presence of the mega stars and the high ranking government officials.